We offer after school classes at several schools throughout Oahu. Each lesson lasts 50 minutes and starts between 1:00 and 3:30, depending on the school’s schedule. To enroll in an after-school session, please complete a registration form. Please call us at 523-8191 for a full list of offerings. If we don’t currently offer classes at your school, but would like to participate, please contact us. Private tutoring is also available. Currently we teach technology classes at Waiau Elementary. If you would like to inquire about having ‘Ohana Komputer teach the computer classes at your school, please call 523-8191. 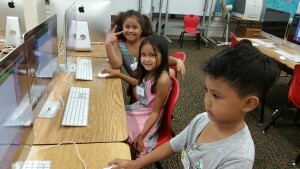 Each lesson is highly structured, culturally appropriate and pertinent to Hawaii’s residents. 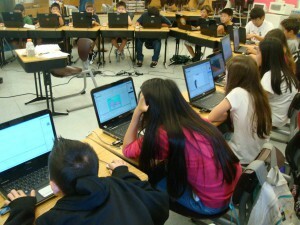 For example, in the desktop publishing units the students create a game board about visiting various sites around Oahu. They create the cover, rules of the game, Chance and Akamai cards, the moving pieces, an advertisement and the actual game board. In so doing so, the technology focus is on using Microsoft Publisher to combine text and graphics with borders, shadows, and WordArt. Students learn a variety of applications in a year including Microsoft Word, Excel, Publisher, Access, PowerPoint, Kid Pix and Print Artist. In addition to the standard 35-hour curriculum, we also teach keyboarding skills for students who lack this essential skill, website design and computer animation. Through a new partnership with Kids Invent called “ Animated Science” we are able to offer classes teaching science principles and computer animation skills.